Is baking a Christmas tradition for you? Baking Christmas cookies is a big part of my childhood Christmas memories. Crisp sugar cookies, buttery almond crescents, hearty oatmeal date cookies, and more are some of my mom's baking staples for this season. Baking began towards the middle of December in the evenings and on Saturdays. Often the sugar cookies were cut and baked, then frozen until we could spend time decorating them. Bells, camels, and trees are the shapes I remember most. When we go to my parents' place over Christmas, we're almost certain to be served a plate of beautiful sugar cookies. My mom and her sister Marty used to try new recipes, as well as the old favourites. One year they made tiny fruits from almond paste mixed with jello powder, I think. The jello provided both colour and flavour to the marzipan. They were pretty, but fiddly, and I don't think they were ever made again. Today I made Rugelach, a recipe given to me by my sister. I prepared the dough a few days ago, and chilled it. Today has been dark and grey, with intermittent drizzle: a good day for filling the house with warm buttery smells. Another year, my mom tried a new recipe for Frying Pan Cookies. The name was very uninspired and turned out to be a sticky confection of dates and Rice Krispies. That was another recipe that never made it to the good list. Today I made some Chocolate Date Nut balls - no Rice Krispies in these, and I think they are pretty good. There is no added sugar and they whipped up quickly in the food processor. No flour, either, so they are gluten free. Decorating the house is another tradition. I've been puttering away at it. The tree will go up next weekend as we like a real tree and we like it to last at least to New Year's. The nativity is set on the china hutch and I switched to red and white dishes on the upper shelves. A beaded garland drapes over the light fixture above the dining room table, hung with tin stars. What are your traditions for Christmas? Do you bake the same things, and/or do you try new recipes? Linking with Mosaic Monday, hosted by Angie of Letting Go of the Bay Leaf. Your cookies look very appetising. Ginger bread men were favourites of mine and my children too. It was something we all did together, and sometimes the best shaped 'men' were hung on the tree. I don't remember my mom baking too many things for the holidays when we were little except big molasses cookies that were so soft and yummy. I have a few things that I make now that are healthier versions of what I used to bake. A friend has a cookie festival every year so she has already started her baking for that. My husband (and my kids when they were here) is always happy to eat her holiday treats. Hello Lorrie, your cookies look delicious. Since hubby is diabetic, I do not bake cookies or sweets. I love your pretty Nativity scene with the lights. Very pretty. Happy Monday, enjoy your day and new week ahead! Similar to yours... ☺️ Have to say that good old-fashioned Rice Krispie treats were my sister’s and my favorites on Friday. They tasted just as we remembered, which did not happen for any of our other selections. I think the change in shortening over the years has a lot to do with this change in texture and flavor. Most unfortunate. I am going to do sugar cookies this week, with my kids and grandkids. A traditional cookie that my grandmother used to make is Russian Tea Cakes. She always made these at Christmas time. I'll be making some of these this week, too! Hello, Lorrie. you were on my mind this weekend as I baked rugelach. I had never had them when you first posted your sister's recipe but thought they looked delicious. Now I make them each year. Another batch is in order as I have a few friends that love them as well and they make a lovely gift. Merry Christmas to you and yours. I grew up making cut out sugar cookies and have made the same recipe all of my adult life, until this year. We decided to forgo the cookies. I did bake a wonderful coffee cake whose recipe has been in the family for years. I like the red and white dishes above your scene....and the pretty twinkle lights. Baking is nice any time of year. I made chocolate cake for my hubby this weekend and since it is ALL his...he ate some out of the pan last night! heehee! Enjoy your week! Dear Lorrie - I love how you decorate the shelves, and the red and white dishes special for Christmas, too. I imagined the warm buttery aroma filling the house, and the gluten-free chocolate nut balls are tempting. My Christmas is secular as one of the seasonal events, mainly for pleasing children as well as for the warmth of family getting together. I like to make a Christmassy feel by decorating the house with some ornaments special for the Christmas. Wish you a very merry Christmas. Christmas baking is a tradition in our house, mince pies, Christmas cake and pudding as well as a gingerbread house and chocolate yule log. Shortbread and biscuits are a later addition as the Grandchildren like to help. Truth be told lately I don't do any baking before Christmas because as the kids have become adults they eat less and less sweets. Our DIL has a baking day with her grandmother and we end up with a good variety of the traditional things from her. I think now that we are on the Eastern side of Washington maybe my other DIL on this side should start a baking day with her Granny, me and little Addy. Your date nut rolls are added to my holiday cookie list. Ginger cookies from an old canal days recipe is a holiday anchor second to the tree. When I was young we made all sort of cookies--a lot of German varieties but for the young one we made spritz and decorated sugar cookies and I continued the tradition with my children and now I make no cookies. We don eat them and nobody comes around---well they do but not to eat cookies---LOL. Pies are the thing now. ...I love all of those Christmas goodies, but they don't love me! Traditions are a wonderful thing! Since moving to New Zealand, our Christmas traditions are finding a beach photo for a Christmas card and having a picnic! I've never been into baking so I've always passed on the Christmas cookie exchanges at work. Your chandelier looks lovely decorated for the holidays. Your rugelach looks scrumptious. Baking Christmas cookies has been a tradition in my family for as long as I can remember. My mom would bake many different kinds and then store them in the coat closet where it was cool. I think all 3 of her kids found excuses to sneak into that closet. When I got married my sister and I would get together every year for a cookie baking marathon. Then I moved away and now try to bake the family favorites myself every year. I have a weight watcher rugelach recipe that I must find. Zach and I loved them. I usually buy the cookies at a church bake walk, but Not this year. Change in tradition because I EAT THEM ALL and I just can't eat all those points. I used to ask my mom to freeze the cookies at her house until 12/24. She is in heaven now, so I just smile thinking of that tradition. I am working on a gingerbread house project. I hope to get it done this week. I am NOT artistic, so here s hoping it is pretty easy. Ive been studying other ginger houses for inspiration. Lorrie - when I was growing up, we had a cookie press that had a variety of plates, so you could create trees, camels, stars. The batter had to be just right or the cookies would come out like shapeless lumps. As kids, this was not a bad thing; we would scrape the rejected batter off the bottom of the press and eat it raw. These days, our baking usually involves gingerbread cookies and my husband's Christmas cake (fruitcake) that is made a month ahead and fed brandy regularly until we crack it open on Christmas morning. Of course, we are big decorators, and you might see some of that in next week's post! Thanks for making Mosaic Monday so mouth-watering! Nowadays we don’t practically eat cookies, so I don’t bake - maybe just a little. Your Rugelach mosaic looks delicious! My mother used to bake every week both salty and sweet, lovely childhood memories. The decoration on your chandelier looks pretty! Happy MM. So lovely to look at these cozy posts in this grey and wet December. Your creche is beautiful. Today I began baking cookies. My husband said don't bake so much, but I love baking. It is one of my favorite things to do for Christmas. In the refrigerator I have date pinwheels, which I have made I think for 50 years. Also cherry winks are one of my favorites. I had to smile that your mother would try new recipes that didn't always work. Each year I like to try one new recipe, so I played today with making chocolates filled with a marionberry. I think I need practice and will try again next week. Experimenting today helped me to rethink how I make them. Enjoy the baking, the wrapping of gifts, and time spent with special ones in your life. 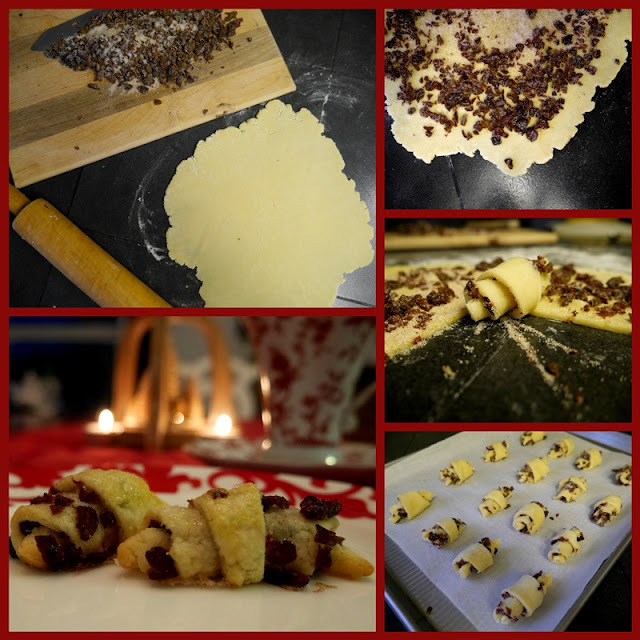 Dearest Lorrie; Oh, what a yummy looking Christmas Baking♧♧♧ Made me wish to try your *Rugelach* ;-) The collage on top of this post also made my mouth watering. I am really interested in your Rugelach cookies. They are new to me. My mother always baked butter cookies. They had to be made a month in advance and age in a secret spot. I usually bake a dozen varieties of Christmas cookies, at least. You can find recipes both on my regular blog and my Christmas blog. Sadly, this year I have yet to bake even one cookie. My hubby baked some chocolate butter cookies dipped in sprinkles last week, and those are in the freezer, but that's it so far. Some of our favorites include whipped shortbread, sacher torte cookies, macaroon kisses, chocolate mint crisps, raspberry shortbread thumbprints, Russian teacakes, and more. This year I am planning on trying a new recipe for lemon shortbread thumbprints, filled with lemon curd. Christmas baking looks different at our house every year . . . although there always is baking! My mom baked decorated sugar cookies every year at Christmastime, but she preferred working alone in the kitchen. All of my girls have loved baking, so we have made good memories baking together. When my oldest daughter had only little children, we would have a big baking day each year. She would come to our big country kitchen and we'd share ingredients and child care and baking duties. It was such fun! She no longer joins us for baking because her "littles" are now "bigs" and they all pitch in with the baking at their own house. My younger girls and I still bake together. We make some of the same cookies each year, but often try a new one too. Your baking pic's almost inspire me to go bake something! Love that white beaded garland. It's looking lovely there. I remember as a young child come the 1st December our house took on a wonderful Christmassy smell … but the decorations didn't go up until mid December. PS I always enjoy seeing your photographs. Oh I wish there was a taste button! I haven't started my baking yet. This week. Have a wonderfully blessed holiday season. Yes, cookie baking at Christmas was just the norm when I was a child, my mother and aunts all had their specialities. All of my cousins knew we'd each get a personalized gingerbread cookie from our Aunt Etta. Those crescent cookies of yours look wonderful, any recipe of them up at your cooking blog? Since I'm late getting here, I'm assuming that this weekend was Christmas tree decorating at your house. I hope we'll be seeing photos of that this week. ice cream buckets full to her grandchildren. I have collected recipes for many years and it's hard to drop one when it's a certain child's favorite. However, these past few years I have adopted more of the old fashioned ones my mom made and dropped some of my own. There are only so many you can eat, after all! What I expect to happen is that suddenly, after Christmas, one of my kids will say, "you never made..." And I can smile and say it's because I was busy making Peppernuts with the grands. I always do some old standby, Lorrie, but love to try new recipes, as well. Cissy and I have been baking up a storm, and I love having my little sidekick in the kitchen with me.